Welcome to the beautiful Seventeenth Century Tradition of Fine Ornamental, Romantic & Functional Iron Work. This all but "Lost Art" of hand craftsmanship is rarely found in todays "high speed" world. Your individually designed and hand crafted piece will provide a beautifully exquisite ambiance to your home or office or stately ruggedness to a functional necessity. Mr. Lofaro is a native of Southern Italy and from the age of six, he apprenticed each day after school in his cousin's iron shop. At age 12, his family immigrated to the South of France. After high school, Mr. Lofaro completed three years at the Ornamental Art Academe, studying architectural and industrial design, metallurgy and fine art.Upon completing the Academe, Mr. Lofaro began studies with the French Master Ironsmith Pierre Geraldi, who is widely regarded as one of Europe's finest ironsmiths. By blending his Italian ancestry with his studies on the French Riviera, he provides an unparalleled "Old World Mastery" in Design and Creation in the lronsmith art form. These techniques, tested over centuries, provide the medium to fashion the finest pieces available today. Absolutely NO hi-tech, or Mass Production here. Mr. Lofaro operates his "Old World Iron Works" business with his two brothers Antonio and Rocco, who also accomplished their Master Craftsman Studies in France. Their combined abilities bring an "heirloom quality" to all their work. Mr. Lofaro came to this country in 1984 and has been at service at Aurelio's Old World Iron Works in Petaluma since 1986. Mr. Lofaro has enjoyed many annual showings of his creations, including the Sonoma County and Marin Home Shows. Your visit to Aurelio's Old World Iron Works offers you the satisfying opportunity to invest in the finest of all metal work. Consider items such as furniture, railings, gates and mirrows, which are just a small sampling of the work available. Roman, French and Gothic are only a small sample of the creative design styles offered. Individual or identical multiple pieces can be commissioned to your specifications. Contractual work is invited. Your design can be fashioned in ferrous or non-ferrous metals, as you wish. 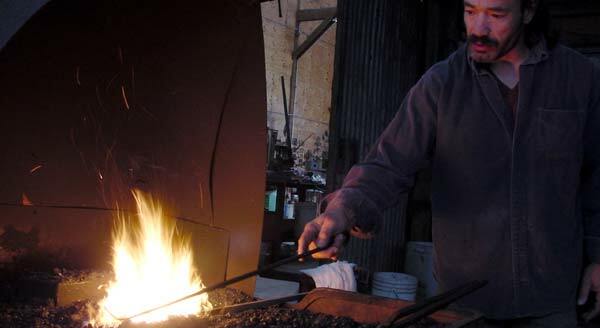 All hand forgings are done with the tradional "Open Hearth Forge "